The D.C. area typically tops lists of the worst traffic in America; vehicle congestion and accidents are far too common in neighboring Maryland as well. Many of Maryland’s accidents could have been prevented if all drivers exercised the right caution. However, some cities and intersections are more likely to be home to serious vehicle accidents. As one study points out, Baltimore, unfortunately, boasts the worst intersections in the state. A recent survey rated one Baltimore intersection as the worst in Maryland. A number of different crossroads in the state could be contenders; however, Reisterstown Road and Gwynn Falls Parkway tops the list as the most dangerous crossing in Maryland, according to a survey from the National Highway Traffic Safety Administration. In 2015, there were 46 crashes at that intersection. It’s estimated that 4.6 million Americans died during 2016 in motor vehicle crashes. For drivers that fortunately survive serious crashes, these accidents still take a big toll on victims and their families. Costly medical bills, stress and other damages can make it hard for the family to ever recover in full. Many of these motor vehicle accidents could have been prevented and were caused by a careless driver’s negligence. If you or a family member were recently hurt in such an accident, you deserve to have your claim evaluated by a lawyer who understands the best way to handle, develop and present your case. Don’t hesitate to contact an attorney who can help. 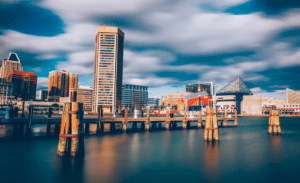 Anyone hurt in a Baltimore City accident — or any crash in neighboring Prince George’s County, Charles County or Montgomery County, Maryland where another driver was at fault — needs a consultation with an experienced lawyer. Maryland’s personal injury laws protect victims injured in a preventable accident. It is essential for an accident victim to quickly take action and engage an experienced personal injury attorney to guide you through the process to maximize a possible claim for recovery. Many attorneys claim to handle personal injury cases, however, you need one with significant experience in this particular practice area and going against the insurance companies and court system. Call the seasoned personal injury attorneys of Shulman Rogers for a free consultation at 877-388-1223.